Last time you were at a class reunion, you were hesitant to eat any snacks, and even more leery of having a long conversation with old friends for fear of your dentures slipping and clicking. Between the inconvenient daily denture care and all the awkward moments, they cause, it may be time to consider better options. Dental implants in Collierville can give you back the life you had before dentures! Find out more about what they are, their benefits, and the cost in the post. Dental implants replace one or more missing teeth that are affected by decay, periodontitis, or other injuries. Unlike dentures and bridges, they replace the entire structure of your teeth, not just the surface for an aesthetically pleasing smile. They provide a strong and permanent base similar to your natural teeth. If you are looking to get an implant, you first must schedule a consultation appointment with your dentist to see if your gums and jaw will be able to support them. After that, a small root implant made of titanium is placed in the bone socket. 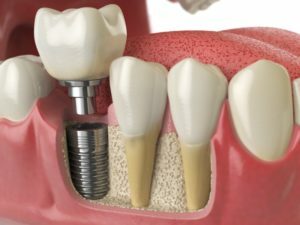 After your gums heal, and the bone growth to surround the implant, a connector called an abutment is placed on the post to attach your new tooth. Your dentist will make impressions of your teeth to model your bite and create your new restoration that will be attached to the posts and abutment. Once the procedure is completed, you’ll be able to enjoy teeth that look and feel completely natural. Even your oral hygiene routine will be identical to what you had before your dentures. With no slippage or looseness like dentures, dental implants give you improved speech because they’re permanent and rooted in your mouth like natural teeth. While dentures can slide or shift, implants offer you easier eating without pain. They offer you overall better oral health because unlike bridges, no nearby teeth are changed to support the restoration. Natural healthy teeth are left intact and your new teeth are able to support proper bone growth. The convenience factor of implants is that they aren’t removable. They look and function as your natural teeth would, and even require the same basic oral health routine. Your self-esteem will get a boost with your new smile and allow you to not worry and stress so much about keeping up with daily denture care. Dental implants are not covered by dental insurance, although your medical plan may depend on how you lost your tooth. The cost varies greatly and is determined by factors like how many teeth you need to be replaced. It’s best to visit your dentist so you can receive a precise estimation for the procedure. Dental implants can change your life, so there’s no point in putting it off! Ditch the special denture adhesives and cleaning solutions and get the feeling of your natural teeth back. Makes sure to schedule your appointment with your dentist today! Dr. Joshua Holcomb is dedicated to practicing fixed and removable prosthodontics and implantology. With a passion for providing thorough and gentle care with his patients, he’ll make you feel right at home. He ensures his patients are given the highest quality of care by continuing and advancing his knowledge of his field. To schedule an appointment, or if you have questions, please visit our website or contact us at 901-612-2477.